To continue with the Halloween festivities, I found this delicious recipe from Food Renegade and thought they’d fit nicely with the fall theme. I couldn’t let Emma go all day without getting something sweet, even if she didn’t go trick or treating, now could I? If you know me, I love to bake sweet treats even if that means they are gluten-free and grain-free. When I came across these bars I knew they’d be perfect for Halloween. The recipe calls for Cinnamon Icing, but since mine didn’t turn out and I ran out of coconut butter, I just left it out. But please help yourself to making both and letting me know what you think. 2. In a medium-sized bowl, combine all the cake ingredients and mix thoroughly to combine. 3. Pour into an 8×8 oven safe baking dish (I suspect you could squeeze 12 cupcakes out of this recipe if you use a muffin tin). Bake until completely cooked through, about 30 minutes. 1. In a mixing bowl, combine all ingredients and use either your mixing blade attachment or a whisk to beat the ingredients until fluffy. 2. Once the pumpkin cake has cooled, cut it into 9 squares and remove from the pan. If the cake isn’t completely cool you are not allowed to proceed. 3. Use a small offset spatula or a spoon and drizzle the frosting over the top. 4. 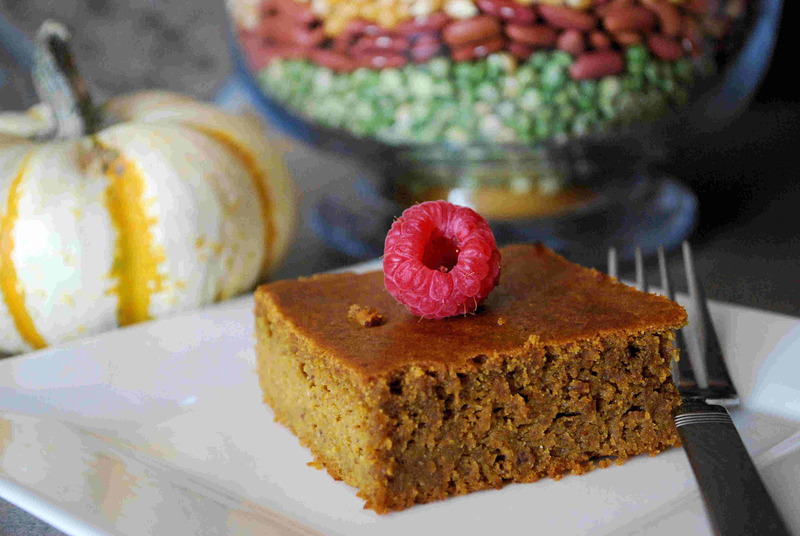 Store the Pumpkin Cake Bars you haven’t immediately annihilated in the fridge. The icing will harden in the fridge, let it come to room temp if you’d like it soft. If you’d like it softer faster, the frosting will melt beautifully if you stick the cake bar in the microwave for 30-45 seconds. Goes great with your morning coffee or tea! Yeah, these were pretty freakin’ tasty, even after they were in the fridge for a day or two. 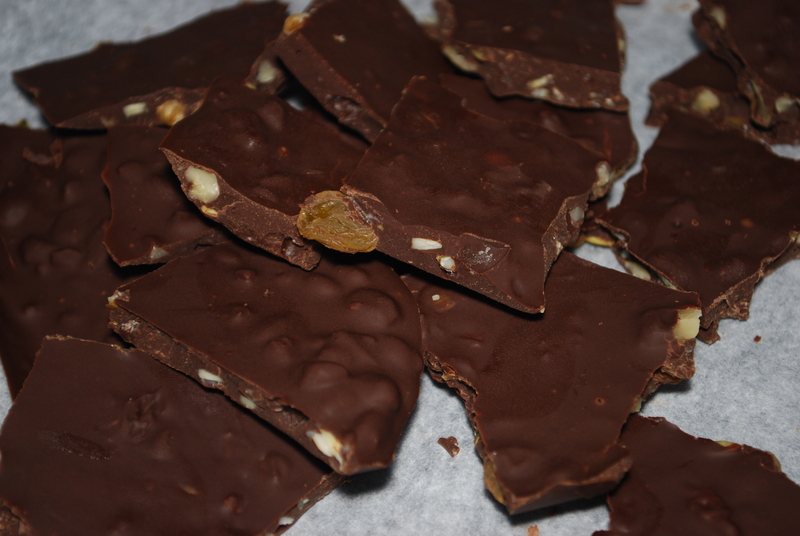 I also made some more of the bark inspired from Practical Paleo, but changed the ingredients up a bit. 1. Melt the chocolate chips with the bacon grease over a double-boiler (with an inch of water in the bottom) on low heat or in the microwave for 30 seconds. Stir vigorously before adding more chocolate chips. Add microwave time only in 10-second increments to prevent burning the chocolate. 2. Stir in the golden raisins, pistachios, walnuts, and sea salt, and spread the mixture on parchment paper over a cookie sheet. Place in the refrigerator to cool. After it has set, chop the chocolate roughly.